There’s been a lot of activity in the IGMR Great Marlin Race (IGMR) over the last few months. Last summer, the program began testing tags from another manufacturer and, so far, the results appear to be excellent. In July, 2018 five tags were deployed at the Bermuda Triple Crown Tournament. Tags were programed to stay on fish for 240 days and to date we’ve only seen one tag report after staying on the blue marlin for a very respectable 150 and the fish travelling 2,740 miles before the tag popped off on the other side of the Atlantic near Cape Verde, Africa. The rest of these tags are due to report by mid-March of this year. Nine tags were also deployed on blue marlin in Kona, Hawaii during and after the venerable Hawaiian International Billfish Tournament that took place in August, 2018. We’ve only seen one tag report from this deployment after 123 days and the fish travelling 1,046 miles. We’re looking forward to seeing what data we receive when the remaining tags report sometime between April and June. Six tags destined for deployment at the Master Angler Billfish Tournament (MABT) in California were relocated to Ascension Bay, Mexico in October, 2018 due to poor fishing at the MABT. The October/November striped marlin bite in Ascension was red hot and all six tags were deployed. Unfortunately, two tags pulled free of the fish after just three days but the other four are still out collecting data and are due to report between June and July of this year. This particular set of deployments is of interest because the striped marlin encountered off of Baja, Mexico are thought to be a distinct stock from those typically caught in California during the MABT. It will be interesting to see where these fish go in comparison to previous fish tagged in California. October, 2018 also saw the return of the IGMR to the fabled Lizard Island Black Marlin Tournament in Australia. Eight tags were successfully deployed during the tournament and are due to report in June of this year. 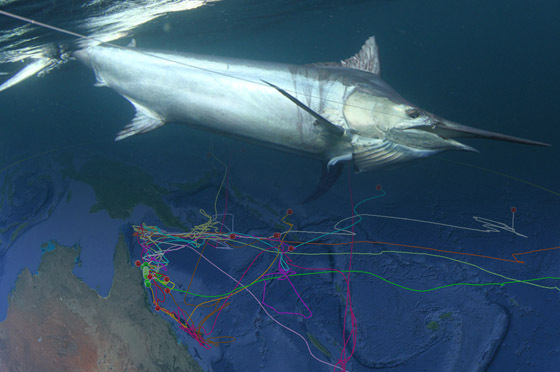 It’s always exciting to deploy tags on giant black marlin off the Great Barrier Reef, as four of the five longest tracks recorded in the IGMR have come from black marlin tagged from this location. Lastly, the IGMR’s most recent event took place in Papua New Guinea during the Tropicana Billfish Tournament. Five tags were deployed during the tournament in November, 2018 and are scheduled to report in July of this year. In addition to the flurry of new tag deployments late last year, the IGFA is also very excited to share new peer-reviewed research that has been published from the IGMR. In September, 2018, IGFA Representative Martini Arostegui and coauthors published research in the journal Fisheries Oceanography on the movement patterns and thermal niche of the first ever satellite-tagged Mediterranean spearfish. Not long after, in December, Martini and his coauthors submitted another manuscript for peer-review publication for six IGMR-tagged shortbill spearfish—another scientific first. IGFA’s partners at Stanford University are also in the process of preparing several new manuscripts on predictive habitat models for billfish using IGMR tag data. All in all, there’s a lot going on with the IGFA Great Marlin Race. Future deployments this year are scheduled for New Zealand, Bahamas, Bermuda and Hawaii. Stay tuned for more updates on tags that have reported and new research being published!